Wednesday of this week serves as our first customer demonstration for our NEW bedrock series of centerless grinders. 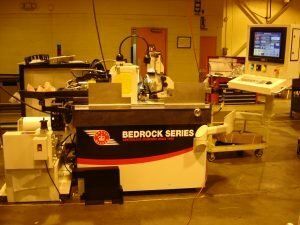 One of the first blogs that was written included a photo of the machine’s bed being machined at Rock of Ages in Vermont. Now the design has come to life and is a machine tool that is grinding applications to under .000010” roundness. After our demonstration on Wednesday for a customer we will be starting to tool out the machine for IMTS. Outside of the machines new design, and superior accuracy we will have some other pretty cool accessories on it. In corporation with Laser Linc we will have integrated into the machine a new LobexTM Lobing Detection System. It performs real-time analysis of centerless ground products to detect and report a constant diameter but out-of-round condition due to lobing of any frequency (e.g. 3, 5, 7, 9…). 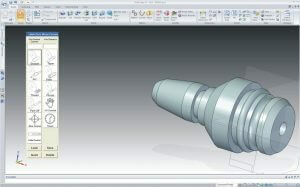 New Software features for programming in virtual templates for CNC Dressing. This integrated system enables you to design your part or template on the machine’s interface. This tool also interfaces with your engineering software to bring the solid model on-board to your centerless grinder. From there it generates the Excel worksheet which will either dress your wheel or grind your part without ever seeing a G or M code. We thought of everything, including a tool tray on an articulated arm that will keep your machine neat and clean, multiple language support, Internet connectivity for lights out grinding, and even a utility that can have the machine e-mail machine production statistics at a hourly frequency. All of this adds up to pretty cool new machine.